Most people don't think of using ordinary binoculars for viewing the night sky. They have many advantages besides being light, portable, see high clarity images and easy to keep clean. Binoculars are also quite cheap for a relatively large pair compared to buying a telescope. A good pair of 7 x 50 binoculars (7 being the magnification and 50 being the size of the front lenses in millimeters) start at around $130. 50mm telescopes joined together. See light gathering power. It's a good idea to use a tripod with binoculars to steady them. They cost between $50 and $200 plus a bracket which is around $25. The supported binoculars give greater detail in the images because they are not wobbling about. Also, it doesn't take long for binoculars to get heavy in your hands after holding them steady for a while, especially if they're a large pair. Ensure if you buy a pair they have a fitting which can be fixed onto a tripod, as some do not. Binoculars can be bought in sizes up to 120mm in diameter and magnifications of up to 70x or more, the images are awesome! Please remember, larger, higher magnificaion binoculars need a heavier, more stable mount or tripod or keep the images steady. Binoculars are great for wide field, bright observations of the emission and diffuse nebula in our Milky Way Galaxy. Comets are brillant through binoculars as a telescope doesn't have a enough field of view to fit much of their tails in. Many faint galaxies outside our own can be seen with binoculars. The binocualr's extremely wide field of view makes galaxies easy to find. 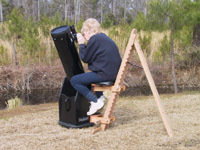 This also makes them a great aid to telescopes for locating the object first and then the object can be viewed through the telescope after it's been found. Finally, of course, the Moon is another great target for binoculars. So, what can't they do? Binoculars extremely low magnifications (7x - 15x) won't be enough bring up any details on the planets, however they will see the major planets as disks and movements of their moons as points of light. Their magnification will also not be enough to see double stars, globular clusters or details in nebulas which only high magnification will do. Still, binoculars will see hundreds and hundreds of objects for a small price tag. It is possible to buy larger binoculars with the magnification going up to 70x or more. This will see the double stars which aren't to close together, the globular clusters and details in nebula, but still willl not be high enough to see the details on planets.